• Solar flame torches absorbs the sunlight all day and convert it into electricity save in the battery. • Energy saving and environmental protection, transform your surroundings into a paradise. • Withstanding all weather conditions, no worries about raining, snowing, hail and frosting. 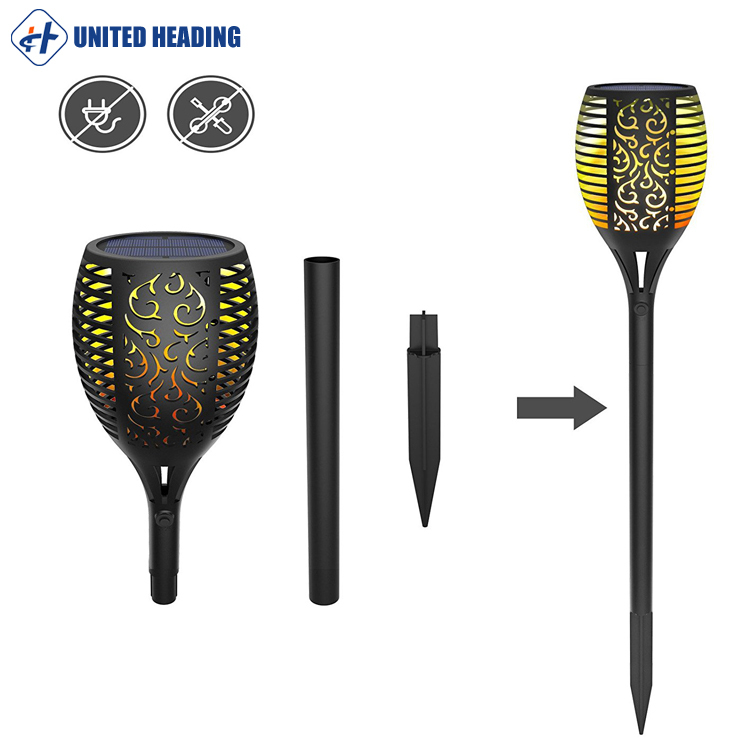 • The flickering torch lights can be installed in anywhere you like, it’s perfect for deck, landscaping, garden, yard, pathway, poolside, patio or any outdoor environment. Working mode: Automatically lights up during dark days, and the solar power will be automatically turned off at dawn. RGB models have three functions: a colorful rotation, second lock monochrome, third gear colorful gradient. 1,Dancing Flames Design: A safe alternative to the real “flames” — LEDs in the light cast a safe, soft, mood-enhancing glow. The actual height of the item is 30.7 inches. 2,Long Working Time: Light up 10 hours in summer and 5 hours in winter after fully charged . Charging time: 8 hours for sunny day. Please keep the batteries to be charged by the solar panel if it doesn’t work. 3,Auto Dusk to Dawn: solar panel with daylight sensor, auto solar power charging, powered by built-in Li-ion battery 2200mAh.Turn on the bulb automatically at dusk and turn it off when it’s dawn. 4,Easy Installation: No wiring required,No electric need. Just put outside like yard, pathways, pool, garden, bench, patio, fence, deck, or outdoor events like party, camping, barbecue, wedding, Christmas, Halloween festival. 5,Weatherproof Eternal Flame: IP65 Waterproof and Durable, withstand all kinds of weather all round the year. 12-month worry-free Guarantee! Please feel free to contact us if there are any concerns or questions.